most who may read this probably do not know i live a secret life in an alternate universe as a professional baker and pastry chef. yes, yes, i have "the most cake and i fake so real i am beyond fake" but for anyone who has any interest in baking, at home or otherwise, the woman who wrote one of the best baking books available just died- marion cunningham. "Marion, who died Wednesday at the age of 90, was a self-professed alcoholic and an agoraphobic who didn't leave California for the first 50 years of her life. It was cooking that saved her, and she in turn was responsible for preserving home cooking through her cookbooks." 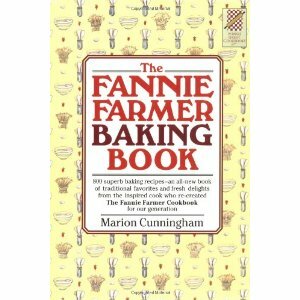 "The Fannie Farmer Baking Book" has to be one of the most consistant, clear and helpful baking books. the recipes all work and work well at most skill levels-which, believe it or not, is not all that common. it has just the right light dusting of granola crunchiness along with the standard but by no means less than delicious and delectable classic home baked goods. if you want to learn to bake or are a professional who needs a very good, very well rounded, go-to fall back reference, get this book. I do a ton of cooking, and I'm actually really good at it to the point that the college town I used to live in, some of my dishes are famous. However, I have to admit I'm pretty pants at baking. It's not that I can't do it, but I just do it so rarely that I don't have a whole lot of my own recipes. Definitely going to pick that book up. yeah- baking is a way different animal than cooking. i've basically always been interested and naturally good at baking but my cooking meals skills are only now just passable- and i think that's just due to being around professional kitchens for years and watching the real chefs. but most of those chefs ( except the actual french ones who apprenticed as serf/slaves in france and learned pastry too-by force), i find always tell me how they just can't bake. and- even further- bread bakers are different from sweets bakers. my non-sweet, non-quick yeast bread is eh/mediocre and that's up from crap after really focusing on it.